Have you ever wondered to know what are the things a library (.Lib) is exporting? Sometimes, a library can export hidden functions that are not given to you on a header file, or did you ever wanted to verify the function syntax against the header files, given to you with a LIB file? If could be a mismatch. In that case, here is the solution for you. This simple tool can go through the LIB file and show the functions it exports, and it can generate a header (.h) file based on the finding. It is much useful for Visual C++ developers. There are some limitations, for that see under the heading “Limitations”. You could have seen some junk characters in place of any C++ function. Somewhere like in Depends (a tool that comes with the Visual Studio, showing the functions inside a DLL). This is called “Name mangling”. The function in the junk format is called “Decorated name”. C++ compilers encode the names of symbols in C++ programs to include type information in the name. So later, the linker can check the exact function and ensure type-safe linking. C compilers don’t need this since only one function can exist in the entire executable linkage. However, in C++, there can exist several functions with the same name in different classes and with different parameters. Therefore, C++ needs this to resolve the function names. In here, I’m exploiting that feature of the compiler. What the tool does here is gather the decorated names in the library (.Lib) file and decode into undecorated names. This undecorated form is the form that exists in our normal header files. 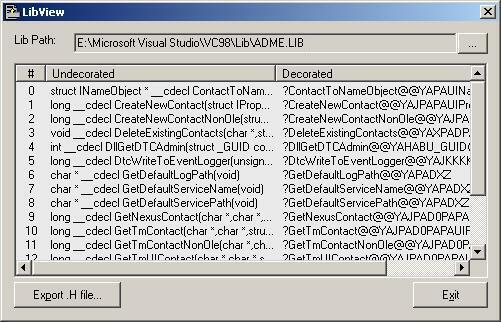 Microsoft™ Visual C++ compiler encodes the names of symbols in C++ programs in this fashion. This is not published by Microsoft™. It is one of their compiler secrets. However, in some cases, you will need the undecorated form. For those purposes, Microsoft™ has supplied a few APIs to decode. That comes in “Debug Help Library” (DbgHelp.DLL). Therefore, in C LIBs, it is not possible to get the header files out. Here only the function names can be retrieved, i.e., by gathering “__imp__” mark to the ‘@‘ character. That’s what the tool does. When thinking of LIBs, it seems very simple and pictures all are in the same category. It is not like that. Every compiler and every version of the compiler may produce different types of LIBs and name mangle. If you see in this context, this tool will/may not work on the LIBs produced by a compiler other than VC++ 6.0. In the exported header file, the functions exported belonging to a class will not appear in a class. It will appear more like a complete function. Another thing is, the C function parameters cannot be retrieved or exported to a header file. If you want to know VC++ decoration format, check out this site. It provides the VC++ 6.0 name-mangling format. Importantly note that this format can be changed without any notice. This tool also I’m not sure will work on VC++ 7.0 LIB files. It would be helpful if someone can test and tell me. I tested this on LIBs produced by eVC++ 3.0, eVC++4.0 and VC++ 6.0 compilers. Hope you find this useful. Thanks.